Hello everyone! Happy 4th of July to everyone! I hope everyone is having a nice weekend and celebrating our Independence Day. 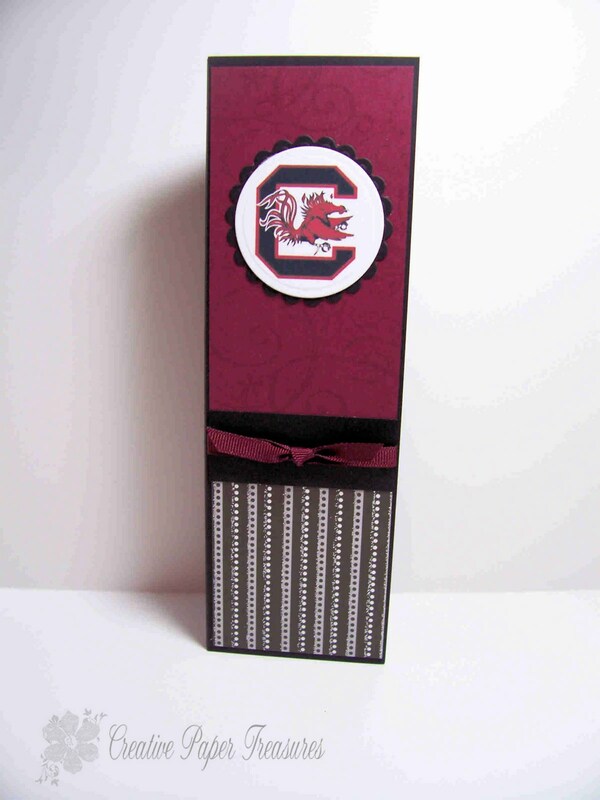 Today I would like to share with you a couple of gift sets honoring our two rival universities in South Carolina, USC (University of South Carolina) or Gamecocks and Clemson University or Tiger Paws. 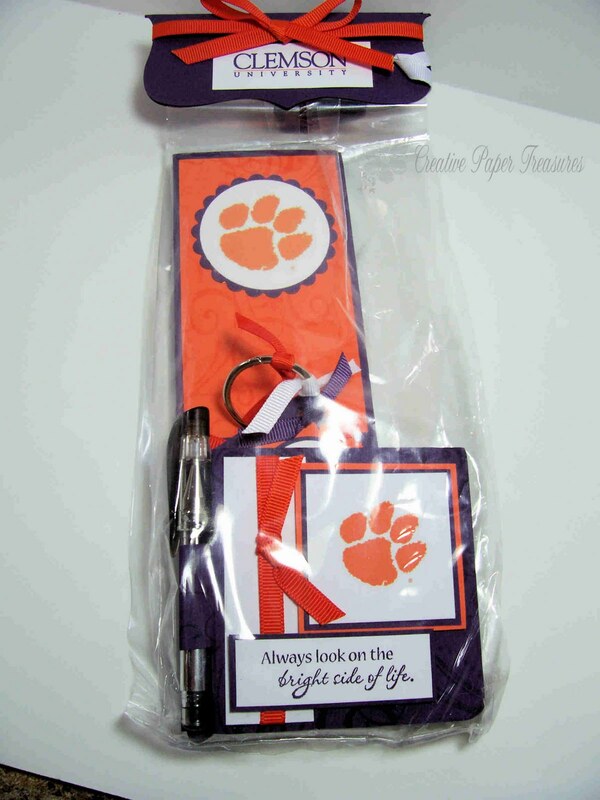 These gift sets include a list pad, a 3 x 3 post-it-note with mini gel pen, and a key ring with a 1.5 x 2 post-it-note. 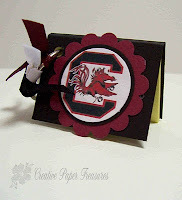 The instructions for the list pad can be found here. I purchased the junior legal pads at our local Staples store where I had them cut in half for the list pad. All supplies are Stampin Up unless otherwise noted. 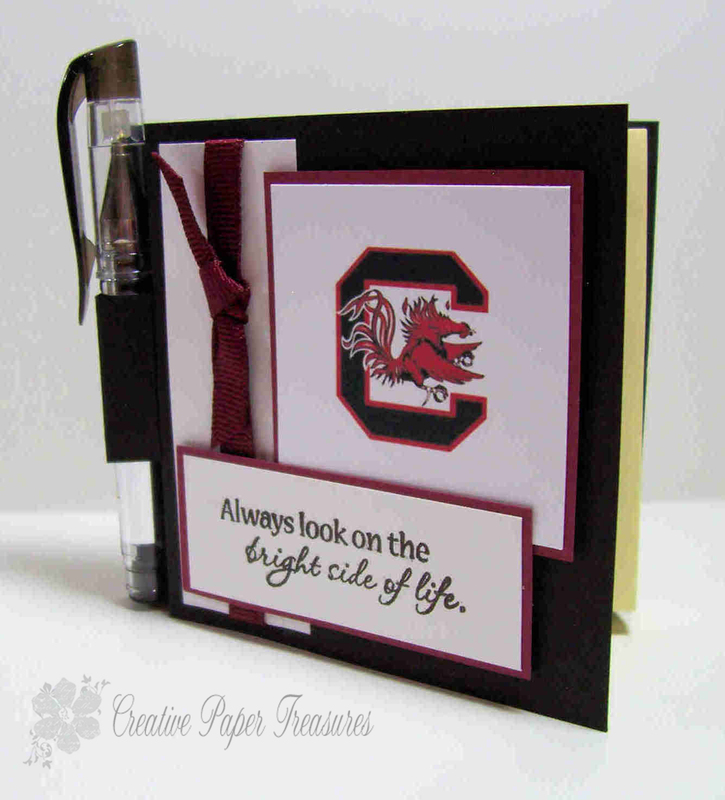 For the USC list pad, I used Bravo Bungundy and Basic Black cardstock. The USC or Gamecock logo was printed on Whisper White cardstock. I used the jumbo So Swirly wheel and Versamark to create a pattern on the Bravo Burgundy cardstock. 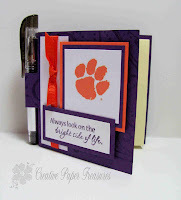 The striped piece of cardstock on the bottom is non-Stampin Up from my stash. 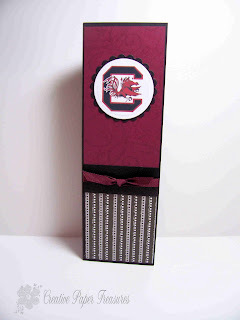 Bravo Burgundy 1/4" grosgrain ribbon is used for the front of the list pad. I cut and embossed the plain and scallop circles with my Spellbinders die. 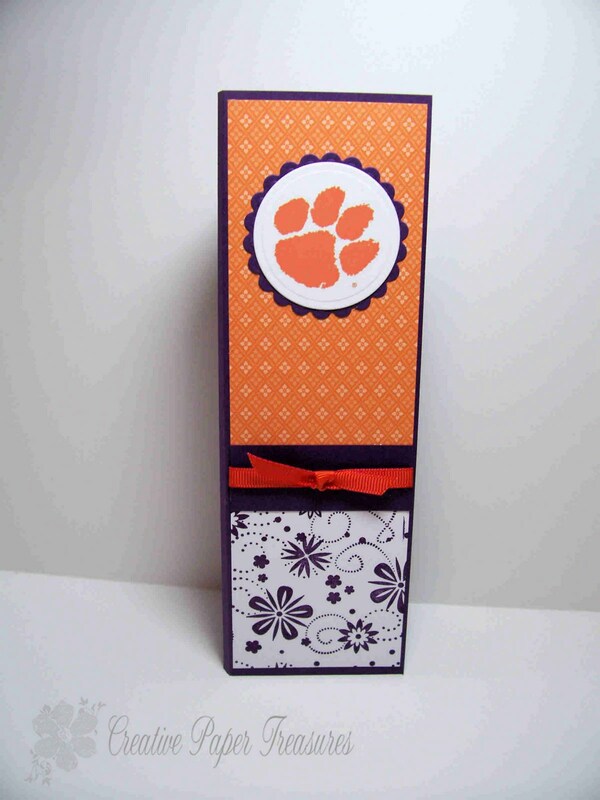 Whisper White, Elegant Eggplant and Retired Orange cardstock is used for the Clemson gift set. 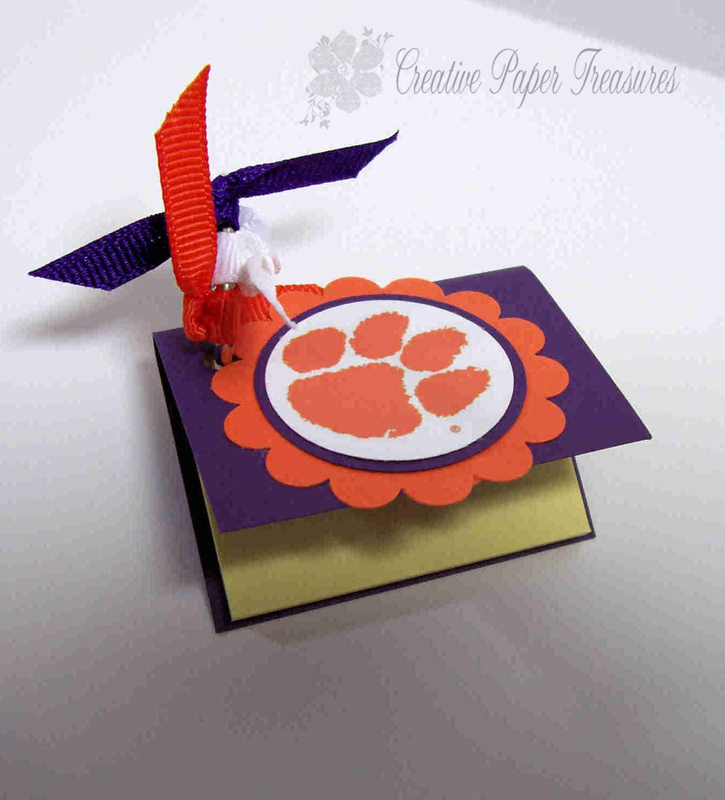 The top of the list pad is Orange designer paper and the bottom is created using the It's Beautiful jumbo wheel with Elegant Eggplant ink on Whisper White. The instructions for making this 3 x 3 post-it-note and pen can be found here. 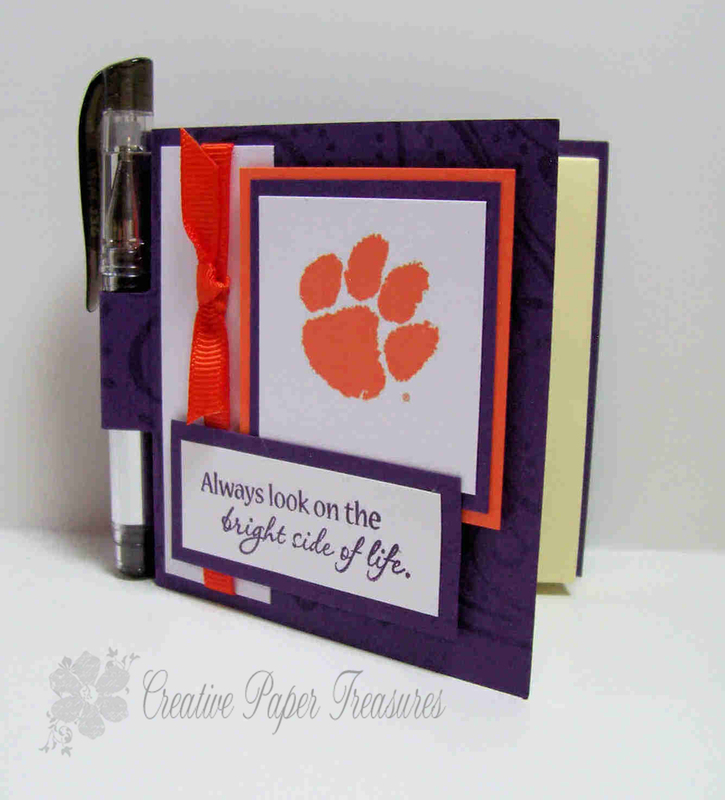 The same colors and cardstock was used here as on the above list pads. 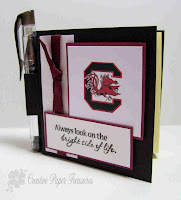 A non-Stampin Up stamp was used for the saying on the front. The instructions and dimensional for this keyring mini post-it-note can be found here. 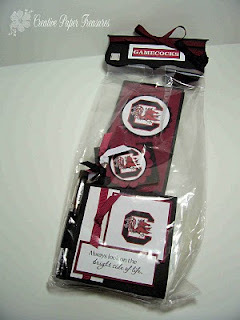 I hope you liked my rendition of two gift sets for our state's rival universities. These make wonderful gifts for both students, alumni, fans and supporters of the colleges. These respective universities have given me persmission to use their logos for my projects. If you are interested in puchasing this set or any of the items separately, please see my sister site http://www.southernbellestamper.com/. Please feel free to leave me a comment if you have any suggestions or questions. As always, I'm open to any and all suggestions, ideas and comments. 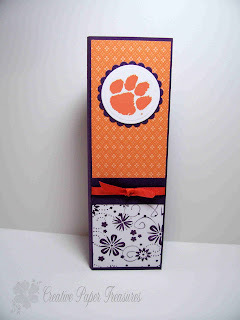 Cardstock: Whisper white, Basic black, Bravo Burgundy, Only orange, Elegant Eggplant, black & silver cardstock from my stash. Ink: Elegant egglplant, Basic black. Accessories: SU Bravo burgundy, Whisper White and Only orange 1/4" grosgrain ribbon, Top Note die, Big Shot, mini gel pen, junior legal pads, keyrings from stationary store, clear plastic treat bags from Walmart. Diane, this is such a cool idea! I love them!